CEDAR RAPIDS, Iowa (Oct. 5, 2011) – Rockwell Collins is bringing the industry-leading capabilities of its Pro Line Fusion ® integrated avionics system to turboprops and light jet aircraft. “Until now, no one has been able to deliver the feature-rich capabilities, robust architecture and enhanced safety that Pro Line Fusion brings to this class of aircraft, and we’re doing it at a lower cost and lighter weight than other systems in this segment,” said Greg Irmen, vice president and general manager, Business and Regional Systems for Rockwell Collins. This latest configuration of Pro Line Fusion includes the industry’s first touch-control primary flight displays, integrated head-up synthetic vision, and autonomous backup flight control modes. Additional features include MultiScan™ weather threat detection and full integration with Ascend™ flight information solutions. Pro Line Fusion was certified in June on the Bombardier* Global 6000* long-range business aircraft. The system has been selected for 11 announced aircraft platforms across the business aviation, commercial air transport and military market segments. 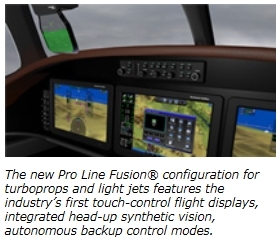 The proven scalability of the Pro Line Fusion software, combined with advanced hardware features such as embedded display processing and highly integrated sensors and radios, are key elements of making the system small enough for turboprops and light jets while bringing more functionality and value to aircraft manufacturers and operators. The system will be available for new aircraft applications as well as a display retrofit for turboprops and light jets equipped with Rockwell Collins Pro Line 21™ avionics. Certification is expected by the end of 2013. New, easy-to-use touch-control capability on the primary and multi-function displays dramatically enhances situational awareness by allowing a pilot to operate with his or her eyes forward through all phases of flight. The Rockwell Collins HGS™-3500 − the industry’s first head-up guidance system (HGS) for light- to mid-size business aircraft, and the only head-up display to include synthetic vision − keeps the pilot’s eyes forward and focused out the window during critical phases of flight. Rockwell Collins’ award-winning MultiScan™ Threat Detection System provides optimal, clutter-free weather information that reduces pilot workload and enhances safety and passenger comfort by minimizing unexpected turbulence encounters. Fully synchronized with Rockwell Collins Ascend™ flight information solutions, Pro Line Fusion-equipped aircraft stay connected to a global network that allows both individual owners and company flight departments to manage their aircraft operations more smoothly and effectively. The first ever one-touch emergency mode for business aircraft affords disoriented pilots extra time to recover by putting the aircraft into a safe-altitude holding pattern and also provides guidance cues to the nearest airport during engine loss. The new Pro Line Fusion offering for turboprops and light jets will be on display at the 64th Annual National Business Aviation Association (NBAA) Meeting & Convention in Las Vegas.